Sparks may not be visible to others, but you're likely see them. The alignment of the Sun and Uranus in an area of the Zodiac last visited in the 1930s, will no doubt bring shocks to most people. For you, this could come in the form of an email or developments in the life of a neighbour or sibling. A further possibility is that travel arrangements will be prone to disruption. Of course, you could encounter all of these developments. 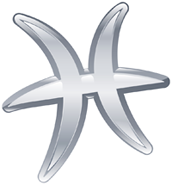 One way or another, going with the flow (not normally an issue with those born under Pisces), will be challenging. The good news is that mid week you could arrive at an agreement (most likely financial in nature) that sets you on fresh course entirely. This might even offset earlier difficulties. With others no doubt exhausted by this week's activities, your particular skill in knowing exactly what others need in order to rebalance should be evident by the weekend. Indeed, by then it might seem that your magic or even healing touch, has allowed those who have allowed stubbornness to get in the way of smooth dealing at the beginning of the week, to learn how to work together.